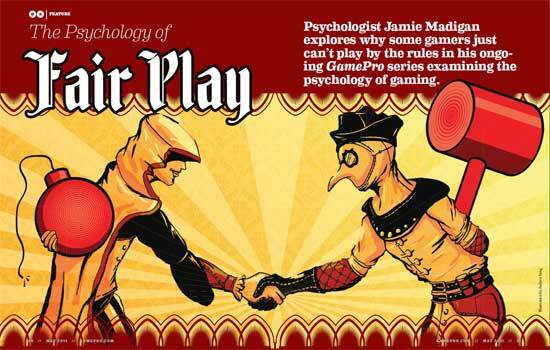 GamePro.com recently put up my article on the psychology of fairness as it applies to video games. You can read it here once you’ve managed the art mouse clicking. Again, it’s in the form of a nicely formatted pdf file so you can see the nifty layout work they did. The irony is that both the hammer and bomb were pre-order DLC bonuses. Click to read the whole article. Here’s an Old Testament story that many gamers may identify with more than they realize: Jacob had 12 sons, but he liked little Joseph the best. So one day he gave Joseph an awesome coat of many colors. It may have given damage reduction against all elemental attacks, but we don’t know for sure; the scripture is kind of vague on the stats. What is clear is that Joseph’s brothers, who had been pretty happy with things before, thought this was unfair, and when Joseph rather blithely told them that he was having dreams of them bowing down to him and his snazzy coat, they decided to throw him down a well. In gaming parlance, Joseph’s coat represents a clear case of “twinking,” which is when players get extravagant gifts that would otherwise be out of their reach. This may come from generous guildmates or players buying in-game money—or even whole accounts—from third parties. Most of us won’t throw someone down a well, but retaliations to these activities range from message-board mutterings to throwing up our hands and canceling subscriptions. The idea was to examine what “fairness” means to people, and to do so with a psychological slant. Is it fair to play on special servers in Team Fortress 2 or other shooters designed to let you farm achievements and unlock new weapons? Is buying gold from a World of Warcraft gold farmer fair? Is it fair to get a bucket full of unlocks off the bat in Dead Space 2 just because you played the previous games in that series? Is it fair to use a FAQ to solve Subject 16 puzzles in Assassin’s Creed: Brotherhood while others figure it out on their own yet get the same achievement? I thought these were interesting questions, and psychology does have some things to say about them. Fairness is a judgment, and we know that judgments can be radically different depending on how the situation is framed or presented. Unfortunately while the question is interesting (I think) I didn’t have a chance in this article to really reach out game designers, academics, or other experts on the topic, so I think the article suffers a bit because of it. But still, I love the artwork and layout that goes along with this one. It’s a nice example of what print magazines still do that web usually doesn’t. I’ve never really liked the example of the people splitting $100. Or rather, I don’t like the way people equate the math going into the two transactions. Person B is not faced with a similar choice in each case even though it may appear so on the surface. By giving the receiver power, you have fundamentally changed the problem from one about fairness in a vacuum to one about the relationships of people with power. Which is fascinating in and of itself, but not what I see people use it for. Still excellent article. Glad I could read the full thing. Nice article. Short. Simple. And it gave me a few categories to think about when I consider how others react to various events. I don’t know why that PDF was so huge.At least it looked nice.